Imagine a malign force dismantling your mind by insidious degrees, stripping away a lifetime of knowledge, cherished memories, and human connections. Now imagine being intimately aware of the process, but helpless to arrest it. Would you be afraid? For retired physician Ben Hunter, that malign force is Alzheimer’s disease—and he is terrified. Now a resident in a major geriatric center, Ben straddles an ever-widening gulf between a muddled present and an idealized past, never quite certain which will support his weight. Against this backdrop, he meets Roxanne Austen, an 18-year-old student who both enriches his life and accelerates his descent into bewilderment. 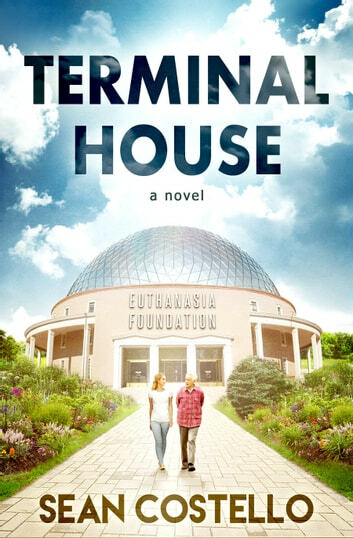 With equal measures of frankness and humor, Terminal House illuminates the many challenges of aging, including dementia, death and dying, voluntary euthanasia, and romantic love. "As a retired editor who doesn't watch television I probably read 300 novels a year (about one a day). Unequivocally, Terminal House is the best of 2016, actually the best for a long while. How someone who is not that old could capture the feelings, desires, memories and fears of an older person is astounding. He emotionally touched the true feelings of both elderly people and the younger persons around them. No one will be able to put this book down once they start reading. Thank you for a beautiful experience and I look forward to more." This is my favourite by this author. The writing is very clear, believable and clear. It's about human frailties, strength of character and friendships that last a lifetime, interspersed with odd ball humour. Recommended reading for everyone, for what may lie ahead,but they might not "get it " until 60 something. While this book is a slight departure from Costello's regular fare of non-stop horror and thriller action, there IS a real-life horror lurking in the pages. The author paints the situation of the slow unraveling of a person's mind in a poignant and heart-felt fashion. Fortunately there are enough moments of levity and mad-cap hilarious adventures of a group of life-long friends coming together as old men and trying to recapture a little of their glory days. And, though there is no intense action to propel the plot forward, the author adeptly keeps the reader turning pages out of sheer compassion for the characters who are three-dimensional and all too real. The story and characters will live with you long after you put the book down. Not the typical kind of subject matter from Sean but enjoyable all the same. Characters are believable and I can only hope that I can age like them. I read this as an ARC, having been friends with Sean through an ex, as well as having done book covers for some of his previous releases. This was bittersweet to read. Doctor Ben Hunter has worked in geriatric medicine, helped to develop an effective treatment for Alzheimer's. He is allergic to it however, on his developing Alzheimer's himself. Set in Ottawa, Ontario, Canada, Ben resides in an imagined assisted living community encompassing housing, entertainment, shopping, health care, and a euthanasia facility. Conceptually, the community is wonderful, as I have visited several assisted living facilities as well as nursing homes over the years, and often they feel isolated when residents lack the energy to take shuttle buses on excursions, or have progressed dementia or Alzheimer's and are not permitted to leave by themselves. Elder care, especially compassionate and respectful elder care is a vitally important field, with an ever-aging population and extended life expectancy. Insight into living with Alzheimer's, even a fictional facsimile is useful for those who have not personally encountered the shifts in personality and temporal awareness a person can undergo.